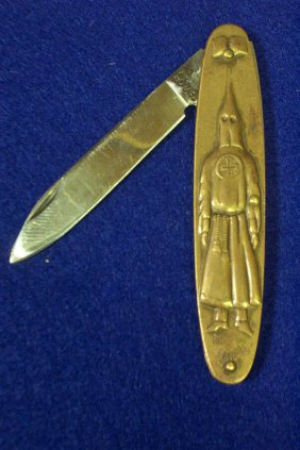 One of the strangest and most out-of-character things on my desk is an artifact of racial hatred, which persisted as a social norm in the early decades of my life: a Ku Klux Klan pocketknife from the 1920s. I originally bought the knife in a junk shop as a “joke” birthday gift for one of my redneck friends. The owner of the shop had priced it so cheaply that he was obviously unaware of its true market value. Also, I made this purchase during my “Forrest Gump” period when I frequently drove my flashy two-seat roadster through the South, and visions of Easy Rider still informed my prejudices. If I ever had a run-in with shotgun-toting good-ol’-boys in a pickup, I reasoned, maybe the pocketknife would help me talk my way out of a tough spot by claiming it had been my granddaddy’s. As it turned out, however, my trips through the South were characterized by some of the friendliest and most hospitable people I have ever met. In reality, the Easy Rider notion was just an intellectual dodge. The truth is, I found the knife to be irresistible in a perverse way. As close to the KKK that I ever got in my travels was buying supper for a great-great-great grandson of Nathan Bedford Forrest, a founder of the KKK and the organization’s first Grand Wizard. Though I had the knife in my pocket all along, I chose not to share it with the boy. I had received no indication that this kid in any way espoused his ancestor’s values, nor those of Forrest’s followers. I didn’t want to be mistaken as an admirer of what his famous ancestor had set in motion. 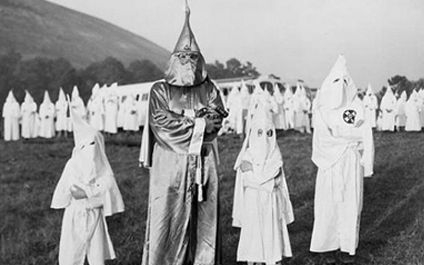 Founded in 1866, the Ku Klux Klan extended into almost every southern state by 1870. It became a vehicle for southern white resistance to the Republican Party’s Reconstruction-era policies, which were aimed at establishing political and economic equality for blacks. At first, its members waged an underground campaign of intimidation and violence directed at white and black Republican leaders. Though Congress passed legislation designed to curb Klan terrorism, the organization saw its primary goal—the reestablishment of white supremacy—fulfilled through Democratic victories in state legislatures across the South in the 1870s. 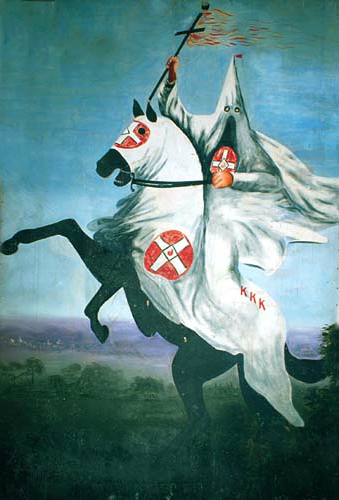 After a period of decline, white Protestant nativist groups revived the Klan in the early 20th century. In 1915, a revival of the Ku Klux Klan was organized on the present site of Stone Mountain near Atlanta GA. The Klansmen were inspired by their romantic view of the Old South, as well as Thomas Dixon’s 1905 book The Clansman and D.W. Griffith’s 1915 film Birth of a Nation. 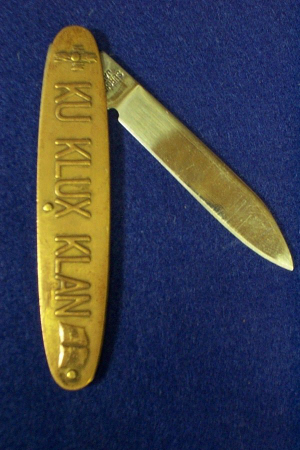 This second generation of the Klan was not only anti-black but also took a stand against Roman Catholics, Jews, foreigners, and organized labor. It was fueled by growing hostility to the surge in immigration that America experienced in the early 20th century, along with fears of communist revolution akin to the Bolshevik triumph in Russia in 1917. At its peak in the 1920s, Klan membership nationwide exceeded 4 million people, many of them middle class. On August 8, 1925, 40,000 members of the Klan marched down Pennsylvania Avenue in Washington DC. In this period, the Klan seemed almost respectable until sexual and financial scandals among Indiana’s Klan leadership caused membership to plummet. Klan membership never recovered from its high-point in the 1920s. Toward the end of World War II, the organization temporarily disbanded in 1944. However there was a resurgence of Klan activity, due primarily to the civil rights movement of the 1960s, mainly among working class and poor whites. This is the Klan which I have always known, mainly due to the bombings of black schools and churches, and violence against black and white activists in the South. These actions, carried out in secret and apparently the work of local Klansmen, outraged the nation. The cases of Klan-related violence became more isolated in the decades to come, though fragmented groups became aligned with neo-Nazi and other right-wing extremist organizations from the 1970s onward. 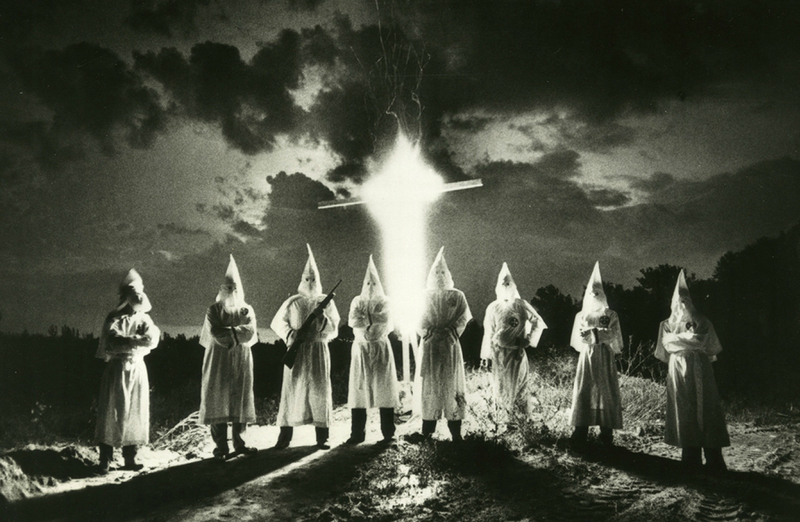 In the early 1990s, the Klan was estimated to have between 6,000 and 10,000 active members, mostly in the Deep South. As long as Klan events are promoted as “A GREAT family event,” feature “Kids’ Korners” and “Klan Kids Kare” promotions, there will probably always be a Klan. Today the demographic tipping-point is a subject of intense discussion and indoctrination. The Klan’s popularity will wax and wane, but will always rely on white fear for survival in the face of multiculturalism.